This post was updated on Nov 27, 2017. When we talk about CRISPR applications, one negative always comes up: the low editing efficiency of homology-directed repair (HDR). Compared to non-homologous end joining, HDR occurs at a relatively low frequency, and in nondividing cells, this pathway is further downregulated. Rather than try to improve HDR, Addgene depositor David Liu’s lab created new Cas9 fusion proteins that act as base editors. These fusions contain dCas9 or Cas9 nickase and a cytidine deaminase, and they can convert cytosine to uracil without cutting DNA. Uracil is then subsequently converted to thymine through DNA replication or repair. Later work has improved base editor targeting flexibility and specificity. New adenine base editors also allow you to change adenine to inosine, which is then converted to guanine. Komor et al. 2016 created a first-generation base editor (BE1) using the rat cytidine deaminase APOBEC1 connected to dCas9 via a 16 base XTEN linker. BE1 displayed an activity window of approximately 5 nucleotides, from target positions 4 to 8. To increase in vivo editing efficiency, the second-generation BE2 system fuses base excision repair inhibitor UGI to dCas9, raising editing efficiency three-fold to a maximum of ~20%. For BE1 and BE2, indel formation is very low (<0.1%) since the DNA is not directly cleaved. To increase base editing efficiency beyond 50%, you’d need a way to copy the edits into the opposite strand of DNA. To do so, Komor et al. turned dCas9 back into a nickase to simulate mismatch repair. BE3 nicks the unmodified DNA strand so that it appears “newly synthesized” to the cell. Thus, the cell repairs the DNA using the U-containing strand as a template, copying the base edit. The BE3 system increased editing frequency to above 30% for a variety of targets in human cell lines, with an average indel frequency of only 1.1%. These numbers are a vast improvement over Cas9-mediated HDR for the loci tested; average HDR-mediated editing frequency was only 0.5%, and more indels were observed than point modifications. CRISPR base editing persists through multiple cell divisions, indicating that this method produces stable edits. However, this system is also subject to off-target editing based on Cas9 off-target activity rather than APOBEC1 activity. Work by Nishida et al. further confirmed the utility of base editing while demonstrating the benefits of base editing variants. Nishida et al. created the Target-AID base editor using a cytidine deaminase from sea lamprey fused to Cas9 nickase. Target-AID acts similarly but not identically to BE3, modifying a 3-5 base window 18 bases upstream of the PAM. Komor et al. 2017 also generated BE3 variants with other deaminases: AID, CDA1, and APOBEC3G. CDA1-BE3 and AID-BE3 edited Cs following a G more efficiently than BE3, but APOBEC3G displayed less predictable sequence preferences. These results confirm that the specific deaminase and the method of attachment to Cas9 impact base editing action and efficiency. Kim et al. used natural and engineered Cas9 variants to develop five new base editors with distinct PAM sequences, expanding the number of available target sites for base editing. For each base editor, they observed editing activity with a minimum efficiency of ~50% and confirmed that the fusion protein retained the PAM properties of the individual Cas9. Kim et al. also mutagenized the cytidine deaminase portion of the base editor to create SpCas9 base editors with editing windows as small as 1-2 nucleotides! To reduce off-target effects associated with base editing, Rees et al. created HF-BE3, a base editor containing high fidelity Cas9 variant HF-Cas9. They subsequently tested the original BE3 and HF-BE3 using a gRNA with high off-target cutting, and they found that HF-BE3 showed 37-fold less off-target editing than BE3, with only a slight reduction in on-target editing efficiency. To further improve specificity, they purified HF-BE3 protein for delivery in ribonucleoprotein particles (RNPs) to both zebrafish embryos and the mouse inner ear. These exciting papers further show the potential of base editing for precise genome modification. Base Editor Variants Described in Kim et al. and Rees et al. Work with third-generation base editors can result in a mix of products; rather than uniform C->T conversion, researchers have observed undesired C->G or C->A conversion. Komor et al. 2017 hypothesized that these byproducts resulted from excision by uracil N-glycosylase (UNG) during base excision repair. Although third-generation base editors contain the UNG inhibitor UGI, adding a second copy of UGI increases base editing product purity. In addition, Komor et al. extended the APOBEC1-Cas9n and Cas9n-UGI linkers to improve product purity, and these three improvements together represent the fourth generation of base editors. Compared to BE3, BE4 offers a 2.3 fold decrease in C->G and C->A products as well as a 2.3 fold decrease in indel formation. To further decrease the already low rate of indel formation with fourth-generation base editors, Komor et al. fused bacteriophage protein Gam to the N-terminus of BE4. Gam binds the free ends of DSBs, which may lead to cell death rather than NHEJ repair, thus removing these cells from the edited population. Adding Gam to BE4 or SaBE4 decreased indel frequency 1.5-2 fold. In just a short time, researchers have expanded the field of base editing far beyond BE2 and BE3. 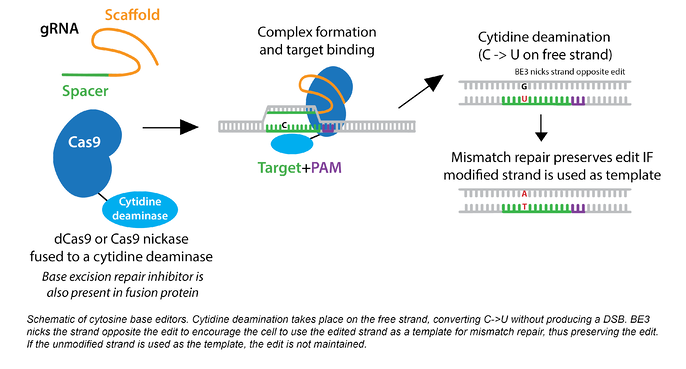 The use of varied Cas9s, cytidine deaminases and accessory proteins has created a suite of base editors with complementary and overlapping functions. The utility of base editing continues to improve, and we at Addgene look forward to the further expansion of base editing tools. Until recently, base editing was limited to C->T conversion, or G->A on the opposite strand. Gaudelli et al. sought to create an adenine base editor that would convert adenine to inosine, resulting in an A->G change. Since there are no known DNA adenine deaminases, they used directed evolution to create one from the RNA adenine deaminase TadA. After seven rounds of molecular evolution, Gaudelli et al. obtained four adenine base editors (ABEs). ABE7.10 is the most active editor, displaying an average editing efficiency of 53% with an editing window of target positions 4-7. ABEs 6.3, 7.8, and 7.9 display slightly wider editing windows of position 4-9, although editing efficiency may be lower at positions 8 and 9. While cytosine base editors often produce a mixed population of edits, ABEs do not display significant A to non-G conversion at target loci. Gaudelli et al. suggest that the removal of inosine from DNA is likely infrequent, thus preventing the induction of base excision repair. In terms of off-target effects, ABEs also compare favorably to other methods. In a head to head comparison with Cas9, Cas9 modified 9/12 known off-targets with a 14% indel rate, while ABE7.10 modified only 4/12 off-targets with a frequency of 1.2%. Although Gaudelli et al. did not conduct comprehensive genome-wide studies of ABE specificity, their other experiments suggest that ABEs are robust but specific editors. Komor et al. 2017 BE4 and BE4-Gam; AID, CDA1 and APOBEC3G BE3 variants A second copy of UGI improves product purity. Gam decreases indel frequency. 1. Komor, Alexis C., Yongjoo B. Kim, Michael S. Packer, John A. Zuris & David R. Liu. “Programmable editing of a target base in genomic DNA without double-stranded DNA cleavage.” Nature 533(7603) (2016):420-4 PubMed PMID: 27096365. PubMed Central PMCID: PMC4873371. 2. Nishida, Keiji, et al. “Targeted nucleotide editing using hybrid prokaryotic and vertebrate adaptive immune systems.” Science 353(6305) (2016). PubMed PMID: 27492474. 3. Tsai, Shengdar Q, et al. “GUIDE-seq enables genome-wide profiling of off-target cleavage by CRISPR–Cas nucleases.” Nat Biotechnol. 33(2) (2015):187–197. PubMed PMID: 25513782. PubMed Central PMCID: PMC4320685.